UK security products firm Securiscape has launched an ingenious safety system capable of protecting people from hostile vehicle attacks by strengthening guardrails currently used to prevent pedestrians from crossing the road. The Derbyshire-based company says its innovation, the HVM Guardrail system, is a convenient and cost-effective way to turn thousands of miles’ worth of pedestrian barriers into life-saving street defences. Pedestrian guardrails are commonly found outside schools and close to junctions and roundabouts and are meant only to ensure that people can only cross the road at designated areas. As such, they are not designed to be strong enough to withstand the impact from a vehicle and so would not be able to protect people from a deliberate attack or road traffic accident. Securiscape’s new HVM Guardrail product makes this possible by using standard guardrail panels in combination with its own Smartpost security system and a host of other innovations – which it is keeping secret - to create a defence system capable of bringing a vehicle to a controlled stop. It means that communities which want to protect pedestrians can now install existing and familiar street defences rather than using ugly concrete blocks and barriers. 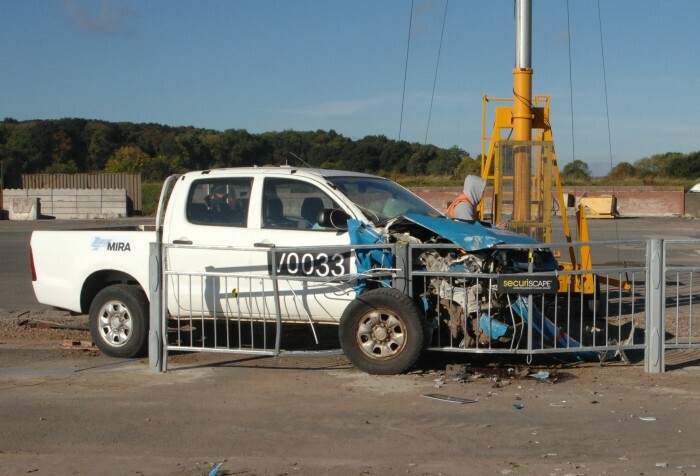 The HVM Guardrail system was put through its paces at the MIRA testing facility in Leicestershire last year and successfully stopped a 2.5 tonne pick-up truck travelling at 30mph using the Highways England standard road test. This earned it the IWA-14 rating, the International Workshop Agreement specifying the essential impact performance require from a vehicle security barrier. Securiscape officially announced the launch of the product at a meeting of 80 counter-terrorism police officers and representatives from a host of Government agencies, which was held last week. The launch follows a two-year development programme which began when Securiscape was contacted by a national body representing a series of faith schools, which was investigating ways in which it could deter potential hostile vehicle attacks on students and parents. Mark Stone, managing director of Securiscape, which is based in Ashbourne, said: “We are extremely pleased to be able to bring the HVM Guardrail to market and were delighted with the reaction that it received at last week’s meeting. The HVM Guardrail is supplied in kit form and can be fixed in using standard Postcrete rather than specialist concretes and grouts, while each fence panel can be replaced separately in the event of damage, rather than having to replace the whole stretch of railings. Securiscape also supplies bollards, security street furniture and both permanent and temporary street planters capable of stopping vehicles weighing up to 7.5 tonnes from gaining access to sensitive buildings or public outdoor events. Established 14 years ago, Securiscape has installed its products outside a host of premises across the UK, including King’s Cross Station, the luxury One Hyde Park residential development in London and Birmingham New Street Station.